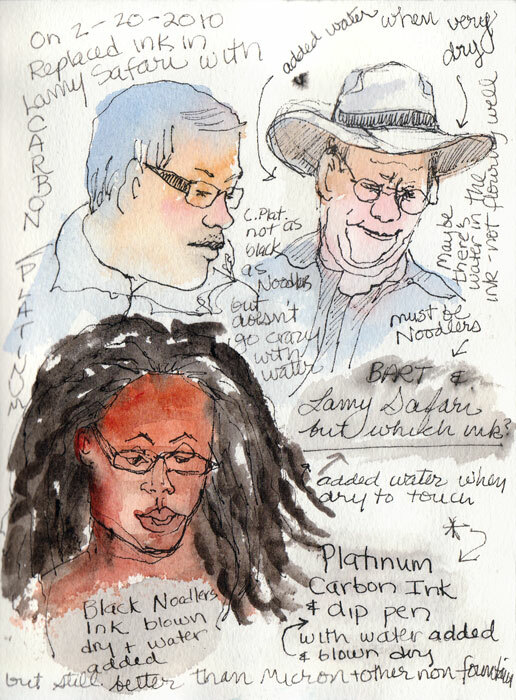 For our Tuesday night sketching we met at Indian Rock Park in North Berkeley. It was so cold, windy and foggy at my house that I put on a turtleneck, a sweater, a down vest, and my winter jacket before leaving the house. I live in the fog belt but just a few miles away, the weather at Indian Rock was lovely with no wind or fog. 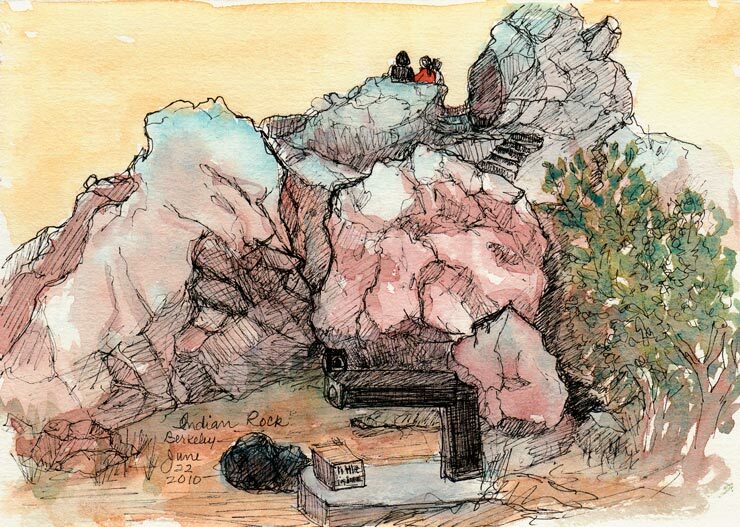 My first sketch was of the giant rocks (below), a favorite site for rock climbers and sunset watchers. 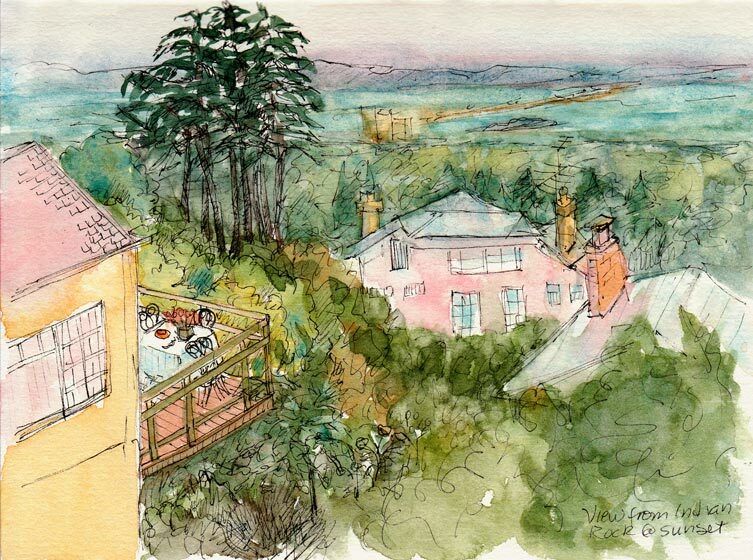 For the non-climbers there are stairs carved into the rock, and I climbed halfway to do the second sketch (above) where I was entranced by the idea of dining on that wonderful deck complete with white tablecloth and spectacular view. A new trend for rock climbers is to carry a huge, specially designed backpack that looks like a giant suitcase. It is actually a folded cushion they put on the ground below where they will be climbing. I find it fascinating how there is an endless amount of specialized stuff to buy for every possible interest. I really enjoyed drawing the rocks but why did I make the stupid drinking fountain so prominent? Oh well. There were quite a few people enjoying the park, including a multi-generation Japanese-speaking family who all climbed the stairs, some hippies smoking pot behind the rock, young sturdy rock climbers doing the spiderman thing, and some girlfriends and couples who like me, perched on the rock to enjoy the sunset. Everyone seemed to be appreciating the quiet, peaceful, night and awesome view all the way across the bay to San Francisco. 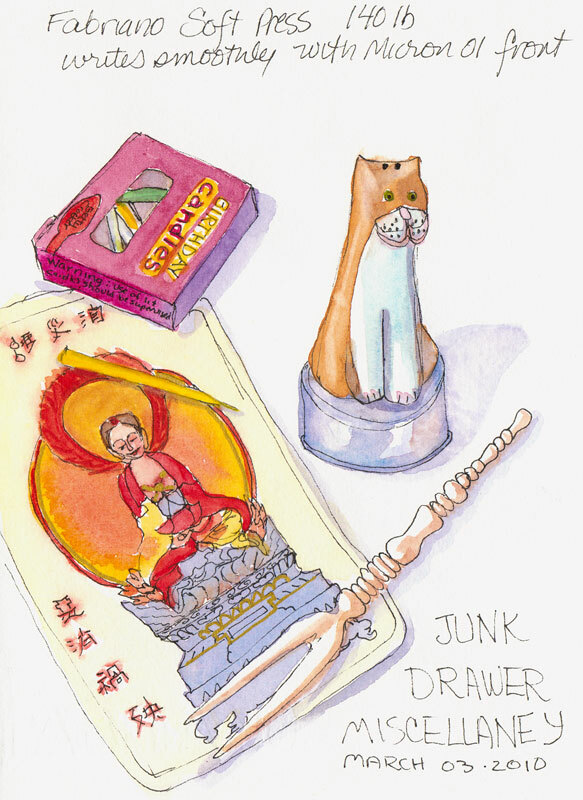 I used random items from my junk drawer as still-life subjects to test paper for binding my next journal. The paper I’ve chosen is Legion Multimedia Aquarelle 300 gsm (a little thinner than 140 lb). An employee at my local Artists & Craftsman store suggested it when I was unsuccessfully seeking the Fabriano Soft Press 140 lb recommended by Shirley of Paper and Threads. I was delighted to find that the texture of the Multimedia/Aquarelle paper is perfect for writing on with the finest of pen points (unlike my current journal’s Arches CP paper). 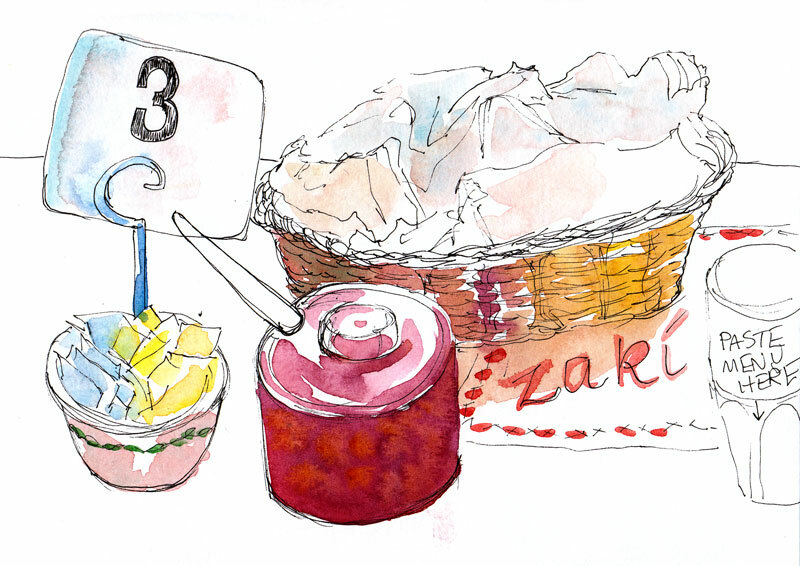 It took watercolor washes and multiple layers of glazes beautifully without buckling, pooling, or pilling. Color lifted off easily when rubbed with a damp brush. The paper is nicely sized to prevent the paper from soaking up the paint, but not so extremely sized as the Arches 90 pound cold press that practically resists the ink. It has two deckle edges and is relatively inexpensive. The Legion Multimedia/Aquarelle paper cost $2.69 a sheet at my Blick store while the Fabriano Soft Press 140 lb paper was $4.99 a sheet. Unlike the Fabriano, this paper is also available in 90 lb weight which I will try next, but I think that will have to be a special order through Artists & Craftsman since Blick only carries the 300 gsm paper. 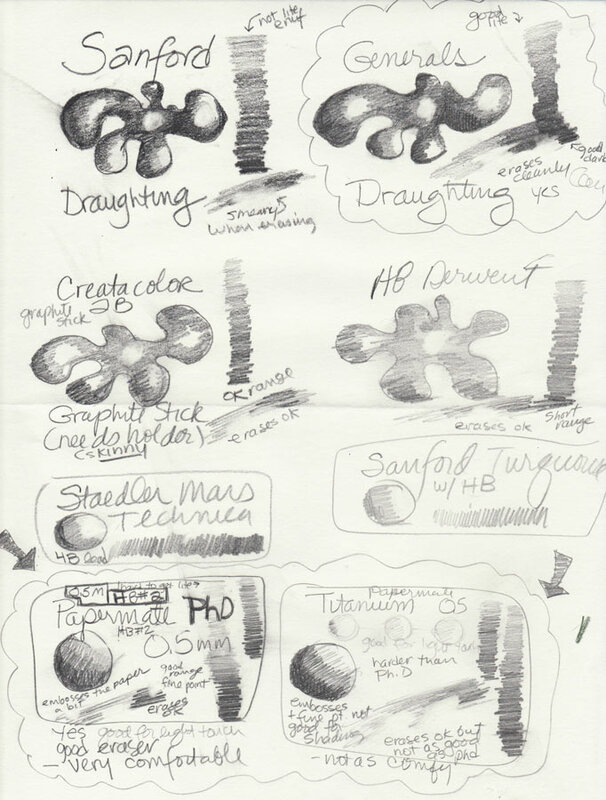 I tested the paper for grain direction and it runs the long way, making it possible to tear it down for a journal just the size I like: 5.5″ x 7.5″, with no waste, which is not possible with the Fabriano whose grain runs the short way. 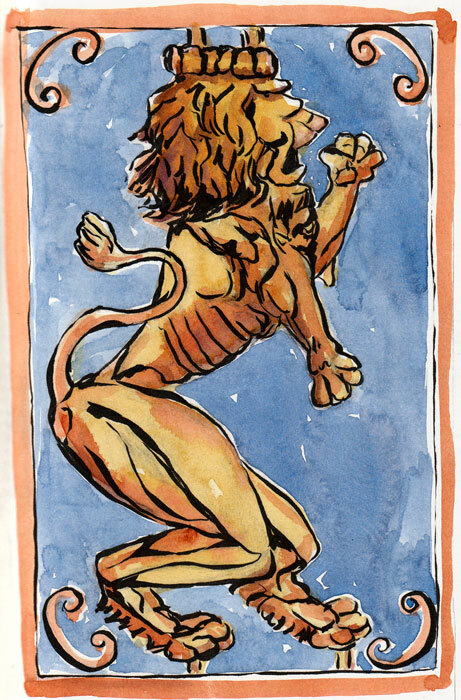 The Fabriano Soft Press paper had some things in its favor but ultimately the cons outweighed the pros in my mind. It seems like good sturdy paper, and the paint lifted OK without surface damage, but it was slightly less pleasant to write on with a fine-point pen, even though the surfaces of the two papers are very similar. Since the grain runs the short way (which means the pages will need to fold the short way) you either end up wasting some of the paper or have fewer size options for the book. Also, the paper is thicker and stiffer, which means fewer sheets per book or a thicker, heavier book. And it is more expensive. 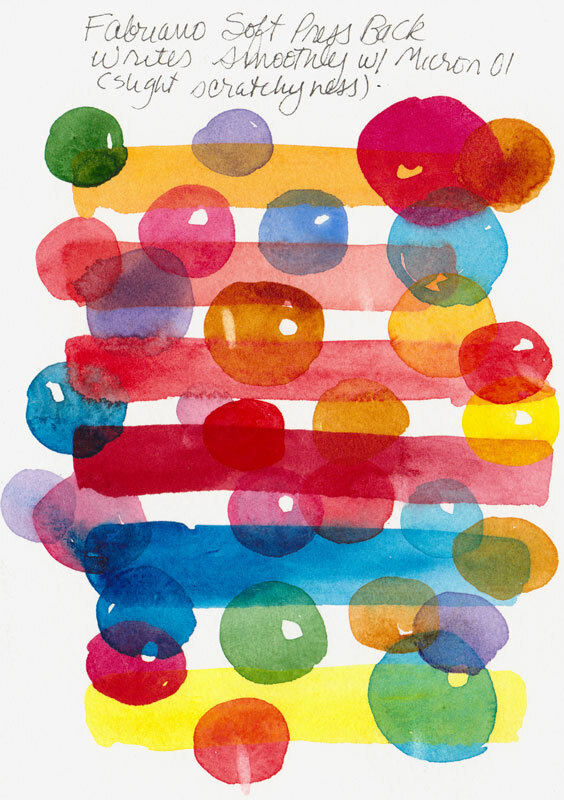 In fact, Fabriano uses an acrylic sizing as opposed to the organic sizing (gelatin) that other companies use. I found that juicy washes on this paper took forever to dry and I assume it has to do with the non-porosity of acrylic sizing. Despite waiting and waiting and finally using a hair dryer before adding the next layer of glaze, the paint still wasn’t dry and glazes bled into each other. I also tested the Arches 90 lb Cold Press in my journal (below). Washes, glazing, lifting worked fine, but just isn’t pleasant to use with a fine point pen. I’m looking forward to binding my new book and then giving the Legion Multimedia Aquarelle paper a true test of its journal-goodness and whether it really is the “perfect” watercolor journal bookbinding paper for me. 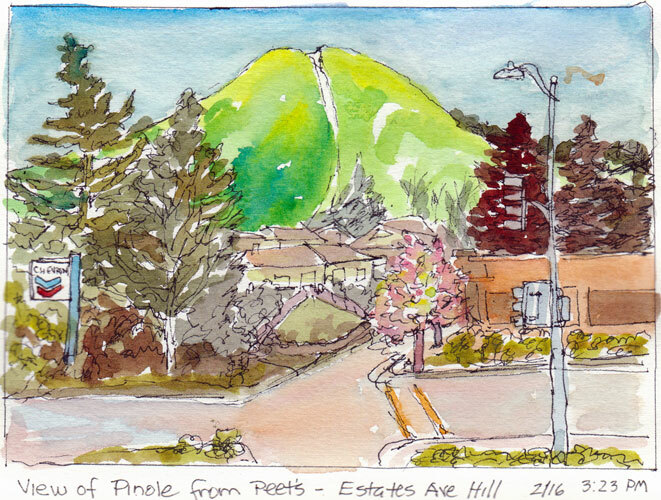 Warm sun, green hills, blossoming trees and a great Peet’s cappuccino to sip at an outdoor table while sketching was made even better by a pen that actually worked in my sketchbook. 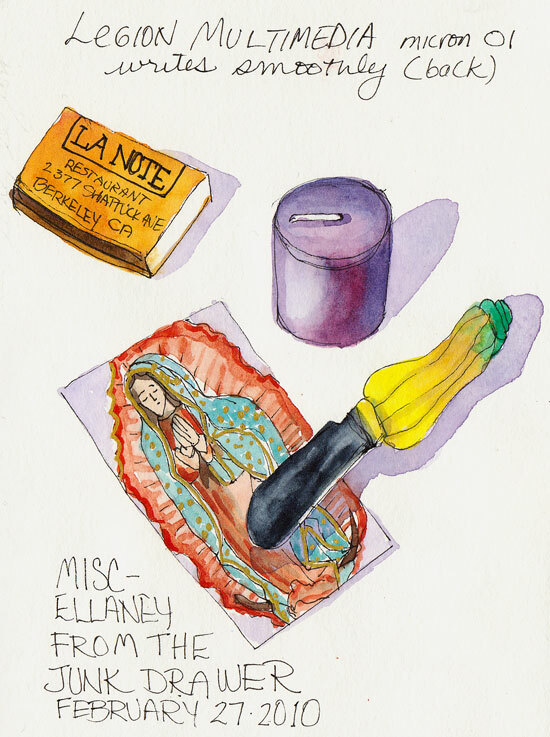 After struggling to find a pen that would not skip, scratch, smear, show through or bleed on the Arches 90 lb cold press paper I’d bound in my journal, I discovered that my Lamy Safari fountain pen was just right. All of the pens I normally use were giving me problems. The Sakura Pigma Micron skipped, scratched over the textured paper when drawing, and was even worse for writing in the journal, whether I used my favorite .01 or a fatter-tipped .05. I tried using an Ultra-Fine Point Sharpie since it would at least produce a strong line (above). But I found that the ink flowed too quickly, bleeding and spreading if held in one spot and worse, showed through to the other side. I also tried the Pitt Artist Brush Pen on this page, which worked OK but was a thicker line than I like for general sketching. The black ink in the finer-point Pitts seemed paler than the Microns, but it might also be that they resist the sizing on the paper more. Prismacolor Illustration pens are similar to the Sakura Pigma Micron and Pitt Artist Pens and are very nice and comfortable to hold. But they too performed poorly on the Arches CP. In the sketch above I was trying to do a contour drawing of what I saw on the BART train but my lines were barely visible until I redrew them with a Sharpie. Then I tested my Lamy Safari F-point fountain pen and was delighted to see that it was a pleasure to write and draw with on the Arches CP paper. I’d last filled the Safari with Noodlers Black Bulletproof ink, which is supposed to be waterproof but actually bleeds a fair amount when a wash is applied after it’s dry. I used a dip pen to test Platinum Carbon Ink and it held up better, barely bleeding at all. So I squirted out the remaining Noodlers in my Lamy and refilled it with the Carbon Platinum ink. I’ve been a happy sketcher ever since. The ink is a rich black, doesn’t bleed, is great to write with on this bumpy paper, and is comfy to hold. Yay! Now that I’m halfway through my journal it’s time to prepare for binding the next one. I’ve been testing papers and I think I’ve found the one. When I finish my tests I’ll post them. I have a feeling I might have found the perfect paper for ink and watercolor journaling. 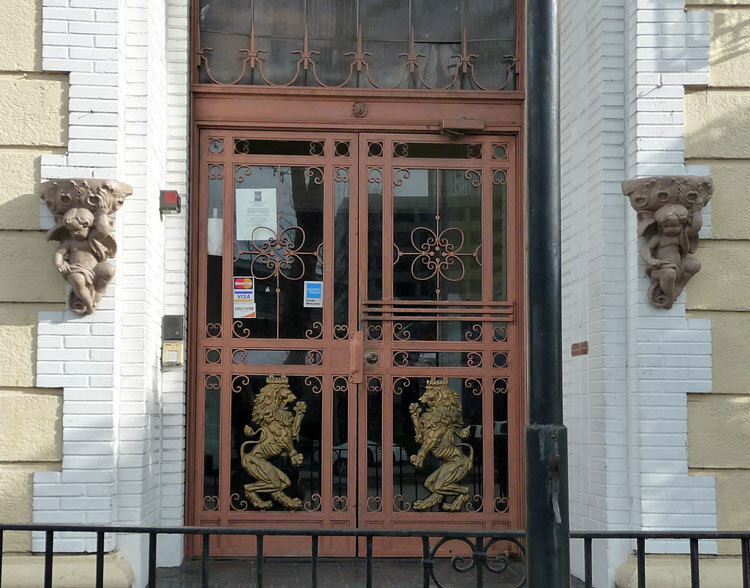 Here is the lion that guards the door at the hotel beside the chubby cherubs on Harrison Street. I love his big nose and stylized fist. 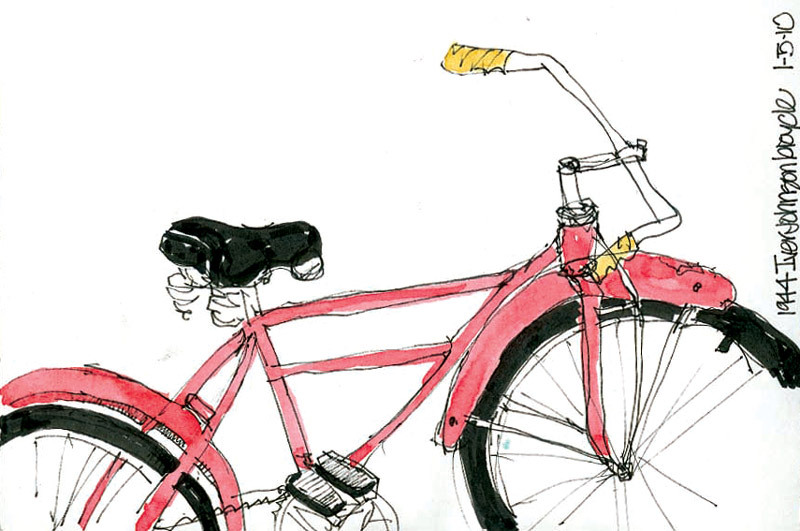 I sketched this from the photo on my monitor from across the room, to simulate drawing from life as best I could. I did a complete pencil sketch with shading and then drew over that with my Pentel Pocket Brush Pen and then decided to erase all the pencil shading and paint him with watercolor. Here’s a photo of the building. 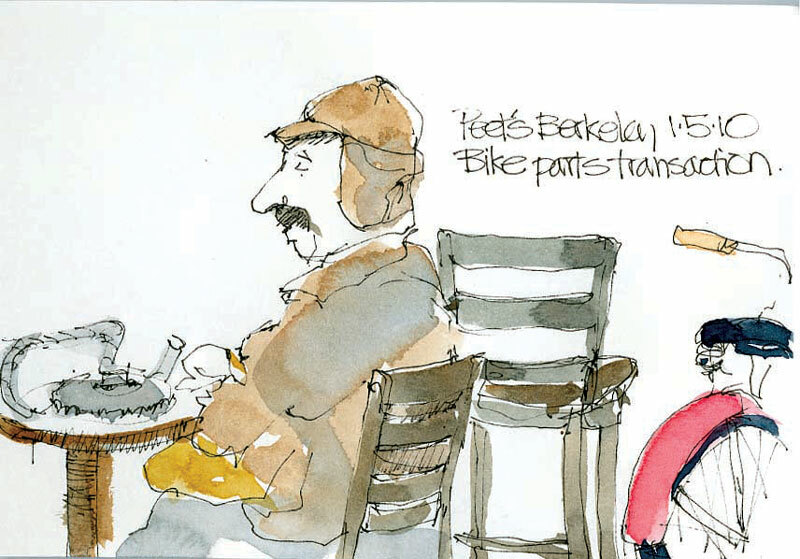 A couple weeks ago when I posted my sketches from the library and Peet’s Coffee I mentioned the old man in a weathered, WWII leather aviator cap and his 1940s era bicycle that Cathy sketched. I adored the way she captured this funny old character who was selling bike parts to a young man so I asked her to send me scans. She did, and now I get to post them below. 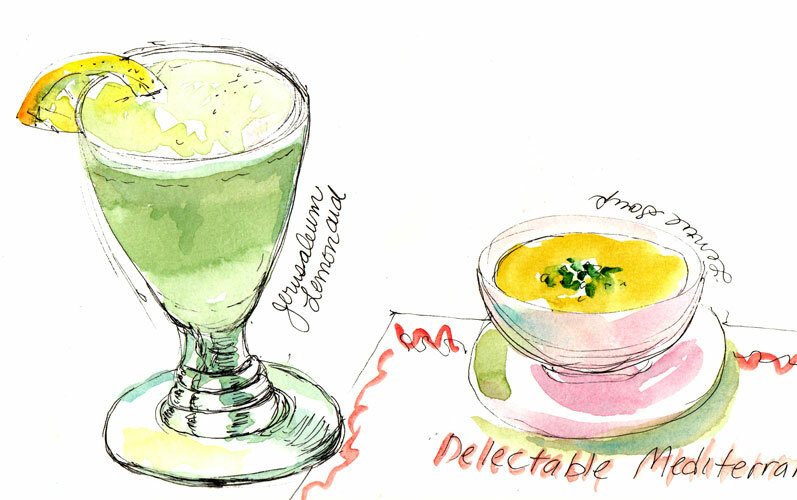 If you wonder why this sketch has a note saying “Paste Menu Here,” it’s because when I said I’d ruined the composition (pre-watercolor) by adding that glass on the right, Cathy said, “Just paste a piece of the menu over that spot.” I solved the problem by just not painting the glass and leaving the note instead. Sonia and I painted at the table but Cathy didn’t like the dim restaurant lighting for painting so made many more sketches instead. I was happy that my colors turned out well despite not quite being able to see them while working. 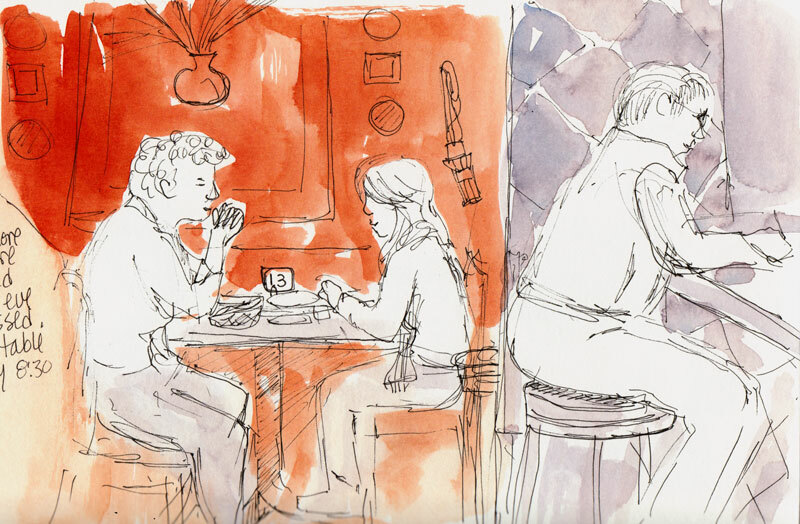 Usually when we’re sketching in cafes we are unable to avoid eavesdropping on nearby conversations, always a source of amusement or amazement at what people say in public. But shortly after we sat down, Ellen, a member of our plein air painting group, arrived to join her realtor for dinner at the next table. 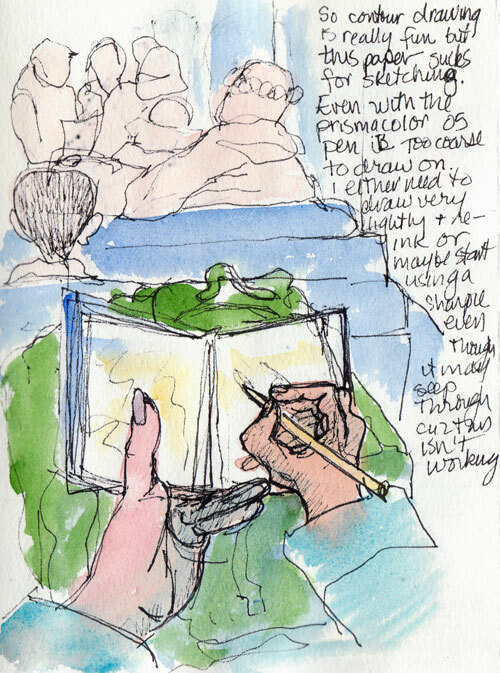 After some introductions, and passing around of sketchbooks (including an invitation by the realtor to show them in their office “gallery” which we declined), we returned to sketching while they dined and chatted. It was odd eavesdropping on someone we knew. Cathy appreciated it though, since they were talking about sofabed shopping, and Cathy is in the market for one too. In 1998 when the movie The Big Lebowski first came out, my father, who considered himself an intellectual, raved about this movie. So I went to see it on his recommendation but couldn’t figure out what he saw in it. Now the star, Jeff Bridges, is in a new movie and people are again talking with great reverence about his role as “The Dude” in The Big Lebowski, which some critics rate in their top comedies of the past 25 years. My son even had this movie in his collection, so I borrowed it, thinking if its popularity spans that many generations, I should give it another chance. I watched it. I still don’t get it. 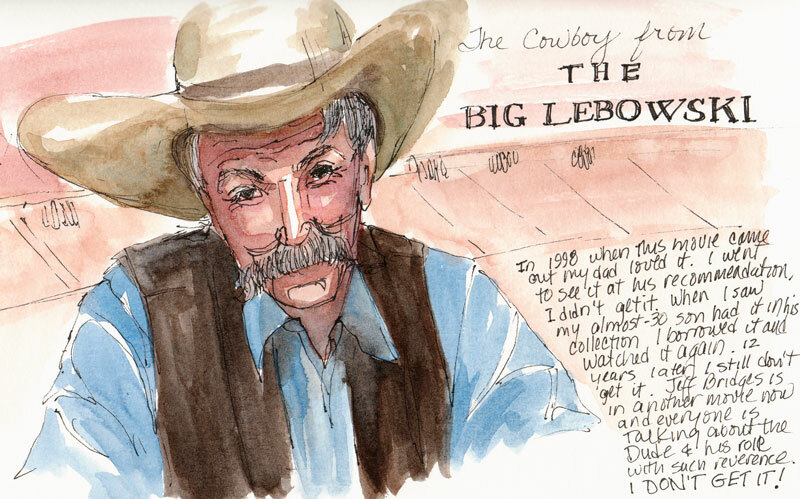 At the end, when “the stranger” (Sam Elliot) who begins the movie with his narration returns to the bowling alley for another sarsaparilla and concludes the narration, I decided to sketch him so at least I had something to show from spending two hours with these morons. Is it a guy thing? Is this a movie that makes guys feel good because they’re not as bad of losers? Do people really think the Dude’s pothead approach to life known as “The Dude abides,” was worthy of worship (there is actually a church based on his character, called Dudeism)? I loved the Coen Brothers’ movie Fargo (mostly because of Francis McDormand) but even she couldn’t save their most recent movie, Burn After Reading, which, after renting it accidentally, I thought had to be the most pointless movie I’ve ever seen. If only the millions of dollars spent on making stupid movies (much of which goes to already obscenely wealthy movie stars) could be spent on feeding people, funding education, the arts, or making the world a better place. 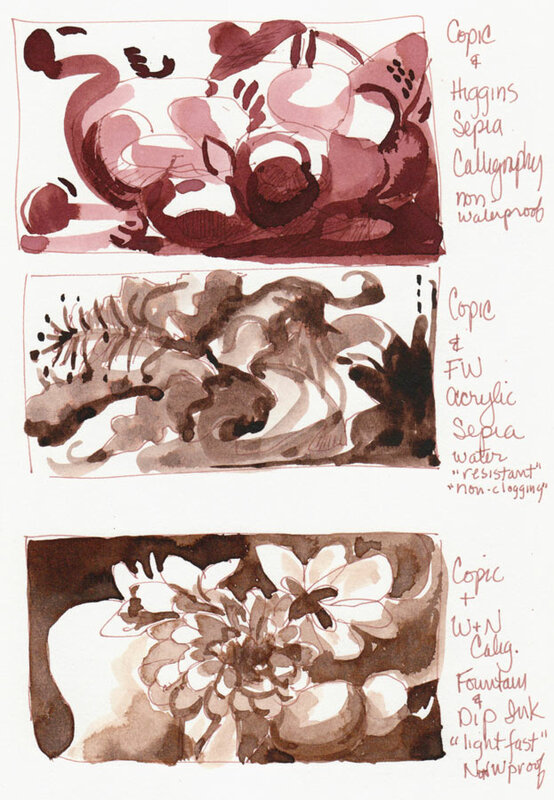 Yesterday I tested some sepia drawing pens and bottled sepia inks to see which I preferred and did the same with an assortment of graphite pencils. 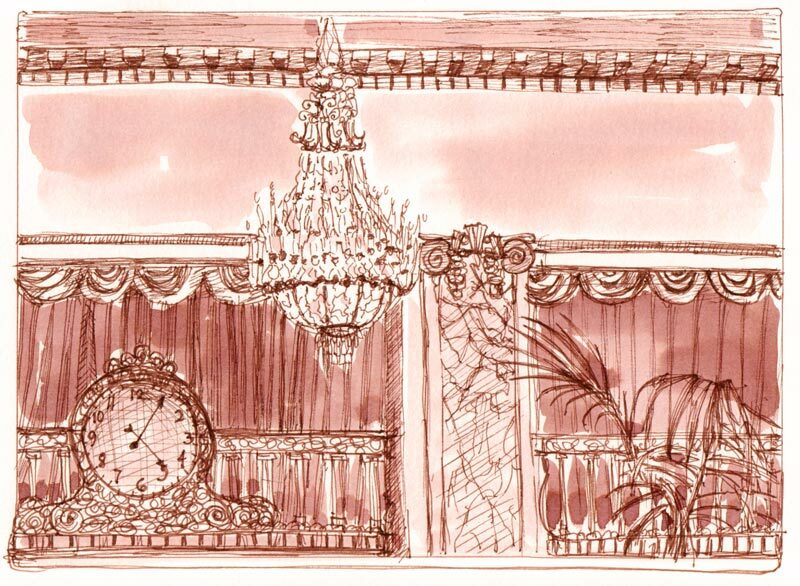 To start the process I added some sepia ink washes to last week’s sketch from the Palace Hotel in San Francisco and like it much better now. 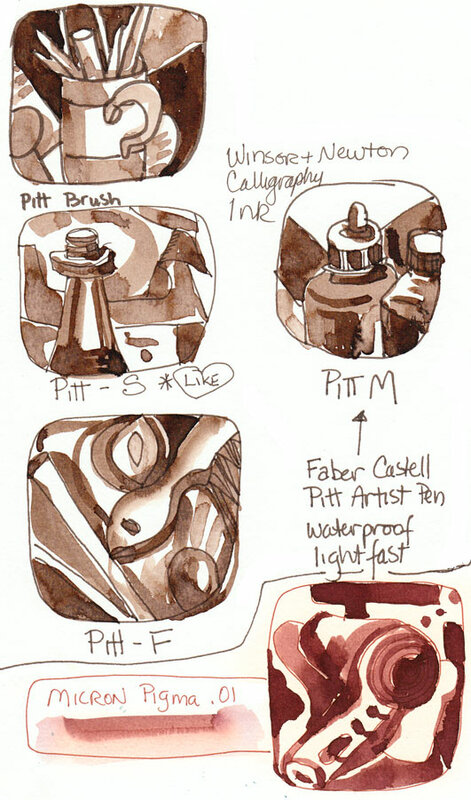 Pitt Artist Pens with various sized nibs including a brush pen. My favorite was the Copic Multiliner SP .03 because of the way the ink and point just glide across the paper, the wide comfortable pen barrel, and the rich sepia color. Because it’s aluminum, refillable and has a replaceable tip, the Copic Muliliner is the most expensive of the three (around $7.00) and I can only get it via mail order which is annoying. 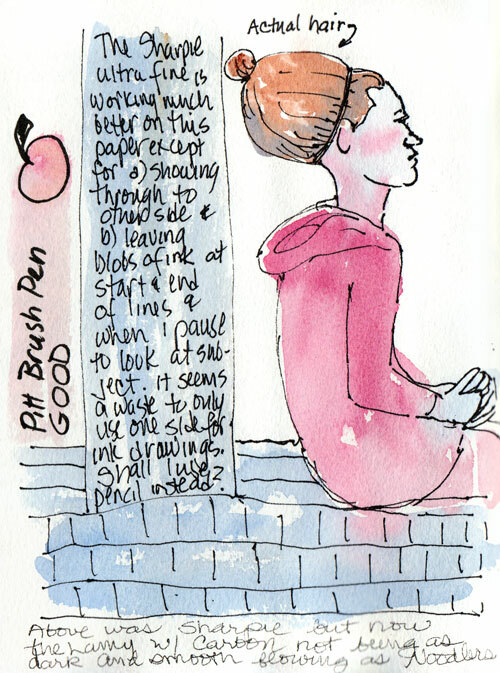 My second favorite was the Pitt Artist Pen with the “S” (superfine) tip. The Pitts are much more readily available in my local art stores and much less expensive (around $2.00). They have a somewhat wide comfortable barrel and a smooth feel when sketching. The Sakura Micron Pigma .01, my former favorite, now seems a bit sharp and scratchy, but does offer more control because of the finer line. The barrel is narrower which makes it less comfortable to hold for long periods. It’s reasonably priced (around $2.25) and a good pen. Traditional sepia ink is made from cuttlefish bladders(!) and mixed with a waterproof shellac base for a transparent waterproof satin finish. Higgins Sepia Calligraphy Ink (label says “non-waterproof” but provides no information regarding permanence). 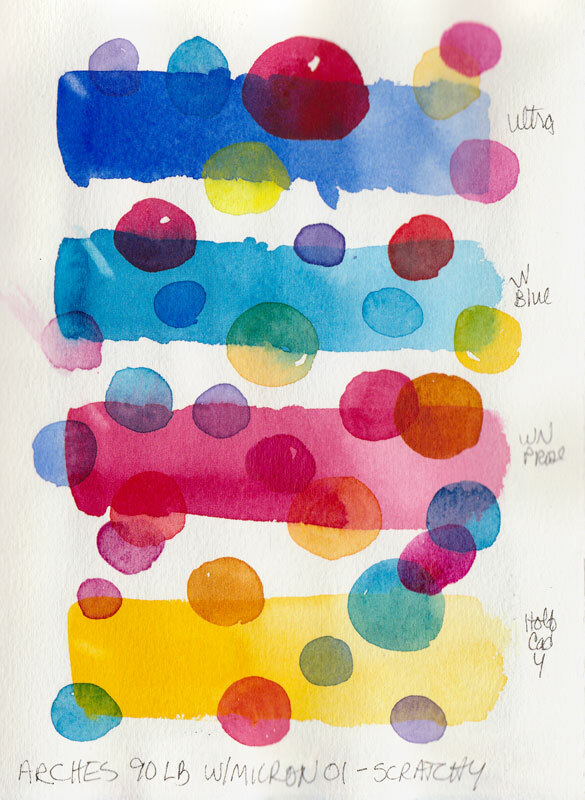 A beautiful warm color that flows beautifully straight or when mixed with water in washes. It is my favorite of the three, but I’m concerned about it’s archival qualities. I’ve sent the company a request for more information and will update this post when I receive it. Since it was recommended to me by an artist I trust who uses it in her fine art, ink and wash work I will continue to use it for now. It comes in a sad, unattractive, square plastic bottle with little self-esteem, and is without an eye-dropper lid. FW Acrylic Artists Ink (label says “water resistant, permanent, highly lightfast”). Ugly chalky dark brown that didn’t work well as a wash, got blotchy and almost seemed sedimentary. It’s made using the same pigments that are in paints, so it’s basically very thin acrylic paint designed to be used in pens. This was the only one of the three with an eye dropper built into the lid and comes in a glass bottle. 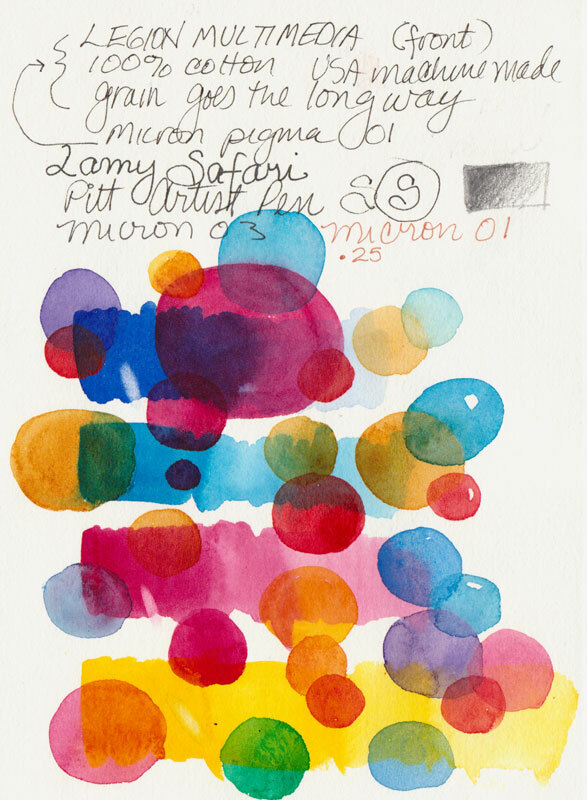 Winsor & Newton Calligraphy Ink (label says “non waterproof, lightfast”). It was OK. It’s more traditionally sepia colored than the Higgins ink. I think I could make it work, but preferred the Higgins. It comes in a glass bottle without an eye-dropper lid. Here is the test page on which I drew with the Copic Multiliner and then added washes of pure ink and ink mixed with water from each of the three bottled inks. On the following page I drew with the Pitt Artist Pens, including the Brush Tip, S, F, and M tips and to match the color, used the Winsor & Newton Calligraphy Ink for the washes. I liked the Pitt S (for Super-Fine I think) and thought all of them were pretty nice. At the bottom of the same page I used the Micron Pigma sepia .01 and the Higgins ink since they seemed a good pairing. Papermate Ph.D. 0.5m HB#2 Mechanical Pencil. The Papermate Ph.D. has a super comfy barrel that has a rubbery, wide triangular shape “endorsed by physical therapists.” This one is especially good for drawing light outlines before inking or painting in watercolor, although care must be taken to avoid embossing soft paper with the fine point. (Close second: Papermate Titanium .05 Mechanical Pencil. It wasn’t as comfortable and it was harder to get a nice dark.) I like using mechanical pencils because it’s handy having the lead and eraser in one unit.